At the Golf Club of Oregon on Saturday. 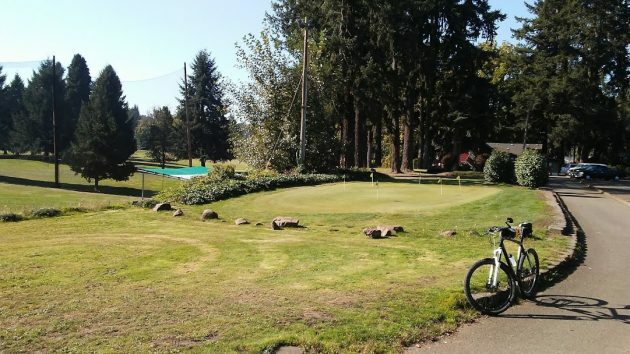 The city of Albany has been asked whether it wants to buy the Golf Club of Oregon, and the answer — so far anyway — is no thanks. The 102-acre, 18-hole course at 905 Spring Hill Drive N.W. (not to be confused with the Spring Hill Golf Club farther north), has been in existence since 1929. 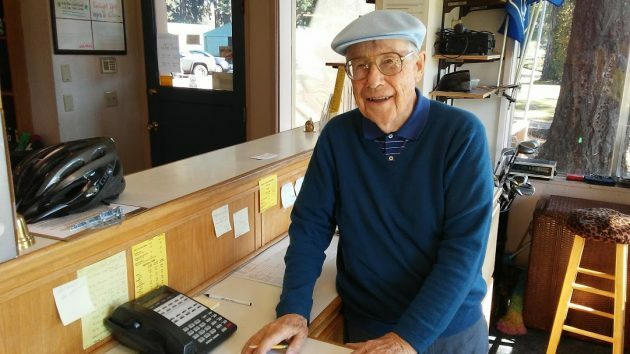 Jerry Claussen has owned it since 1977 and, at age 83, operates it still. Current fees for 18 holes range from $16 to $32 depending on the age of the player, the day of the week, and time of day. Discounts are available, up to 50 percent off for 50 rounds. In the tax case, decided in April 2011, the judge cited an annual revenue forecast of $650,000 and operating income of $136,500. Benton County had assessed the course’s property value at $1.5 million, and the judge lowered it to $1.2 million. For 2018, the property tax bill is $15,213. On Saturday, I found Claussen behind the counter in the golf course shop. He told me that golf had declined in popularity over the years, not just here but across the U.S. He wondered what the renewed success of Tiger Woods might mean for that trend. The Golf Course of Oregon is in the Willamette River flood plain and outside the city limits. It is bounded by the river, Spring Hill Drive, and the long curved trestle of the Portland & Western Railroad. This isn’t the first time the course has been offered to the city. Back in the 1980s, Albany declined a similar opportunity. Jerry Claussen at work in the golf course shop on Saturday. That’s too bad, would hate to see it go. Unfortunately the only thing parks and rec really cares about is softball. Corvallis has a much better offerings from their parks and rec. Not just what the guy running it is interested in. Marysville golf course in Corvallis has had a hard time finding a buyer. It is a similar scenario to this golf course. Floodplain and city limits make it impractical for housing. It does though have a good water right. About the only people I can think of that would consider the land worth a million would be a produce farm operation like the one on Stahlbush Island. With the beautiful park like scenery, it seems like it would be a great seasonal campground. If it could be setup with spots for tents, trailers and RV’s, it could make a go. In addition to Albany, Corvallis is right next door as an attraction. The RV campground right off one of the I-5 Jefferson exits is always full. While this would not be on I-5, the location near town and the river and beautiful scenery could make it a draw. May have to close down if there is flood danger, but for much of the year, it would be great. Or, in the same vein, maybe it could work for a summer youth camp, if there is some location above the flood plains for bunk houses. Or of portable Yurt ilke tents could be used, which could be stored during the high water season. Our children have enjoyed Camp Tadmor out past Lebanon over the years, as well as Camp Big Lake over by Sisters. This article is ominous and auspicious at the same time. The fact that the someone is suggesting within the City of Albany that the Golf Club of Oregon could be sold possibly for other purposes is completely heart breaking. The Golf Club of Oregon is an American landmark in my opinion. The history of the golf course spans back to Albany’s beginnings. The railroad trestle that runs along hole #1 and hole #2 is picturesque reminding us of Albany’s industrial history and maybe gives a little luck to your ball if you pull your shot left. The joining tees on hole’s #6 & #14 and hole’s #7 & #12 brings the community together. There is no other course like it, and she should be preserved and treated with respect as long-standing member of this community. I used to work at the Golf Club of Oregon as a night waterman during the summers I was going to college. I thought the job would be glamorous with free golf – it was long dark hours, wet, and tiring – I think I played only handful of rounds during that time – but I loved it. I don’t find it surprising that golf has diminished following Tiger Woods career. People forgot that the game is bigger than any player. The Golf Club of Oregon needs new energy with someone that cares about the course. Ever since I watered the course I have thought about buying it myself; who knows what might happen. I am dealing with another land issue and the City of Albany. This last year I purchased a home in Edgewater Village next to the Dave Clark path. When I was shopping for the house the developer told me that I would own the property directly behind the house down to the river. Later he corrected himself and told me that it would belong to the HOA that I would belong to. I went forward with the purchase because I would still be allowed to use the property and take care of it as planned. After I purchased the property I learned that I was one of two owners of houses in the neighborhood. The rest of the ~17 houses are owned by the developer and are rentals. Now the developer is proposing that we give this communal land to the City of Albany. I voted no on the HOA ballot, but I will not be the majority vote. In both cases I think we as Americans need to preserve land and start looking at right verses wrong and not the bottom dollar; the bottom dollar will ruin this country. Can’t afford a golf course, or sand volleyball, or youth lacrosse, or, or, or…the stuff other municipalities put on. But we got new softball matts you don’t need for next year!